On February 16th, while taking my German Shepherd/Pitbull mix, Disco outside, I saw some shadows scurry across the yard. Upon closer inspection, I saw three puppies! There is a vacant house and shed next to mine where someone had dumped them in the shed. Immediately, they were scooped up and overcome with "lovin's" as I like to say. My boyfriend, his brother, my neighbor and myself fed them and took them inside. My neighbor and I made a trip to the store to get puppy food, puppy pads, collars, leashes, dog bowls, medicine, you name it! There was no way I could let these baby girls go. At first, I thought they were Rottweiler mixes, but after extensive research, and help of this website in particular, I realized they were mixed German Shepherds. All 3 of them have found wonderful homes now. I, of course, kept one sweetheart, I've named Valentine, my best friend has adopted one to add to her family and named her Sadie, and the other pup went to a friend of my boyfriend's who has several acres of land and young children full of love and energy to share. I've yet to get an update on "Flip Flop," which is what we called her momentarily, but I know she's going to be just fine. After I dug more and more into researching about these puppies, I realized they were as young as 3 weeks when I found them. They're all growing each day and their cute little ears are beginning to perk. I love how little they are, but can't wait to see what they'll look like as adults! I'm so happy these puppies found me to help me bring joy to others. 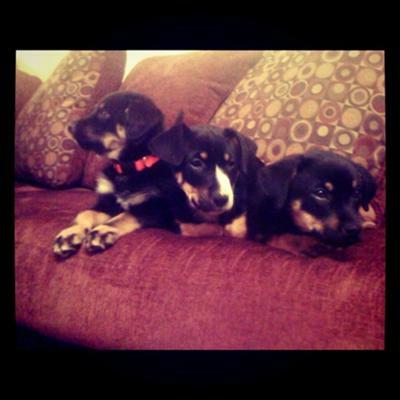 PHOTO: (from left to right) Sadie, "Flip Flop", and Valentine. Hi Whitney. Thanks so much for taking the time to come here and share your own personal GSD story and picture of your beautiful puppies with us all here. What a sweet story.